★ Wooden Arc Frame: 100% imported Russian pine that is coated with varnish to protect it from fading, mold or mildew. We still recommend you to store the hammock combo when you don't use in bad weather to prolong its life and appearance. ★ Included a breathable Cotton Canvas Hammock and Wood Hammock Stand, Hammock bed is 78 x 48-Inches; Stand is 12 x 4.4 x 3.9 ft.
★ Handcrafted polyester ropes, wooden stretcher bars and heavy-duty hanging loops ensures sturdy support with a weight capacity of 350 pounds. Feel free to swing on this hammock combo. ★ Mother Earth Striped is stylish and contemporary, wooden crescent arc stand is out from the crowd with its unique design. ★ Easy Assembly Required, all hardware and tools included. In this way, it can be easily assembled and disassembled to store or put in the trunk for travel. Where do you spend your lazy days? We believe there’s no better place than a hammock. That’s why we created Lazy Daze Hammocks: A hammock so genuine and yet innovative that will turn your home,garden or camping spot into an oasis of relaxation and ease where you might want to hang out forever. 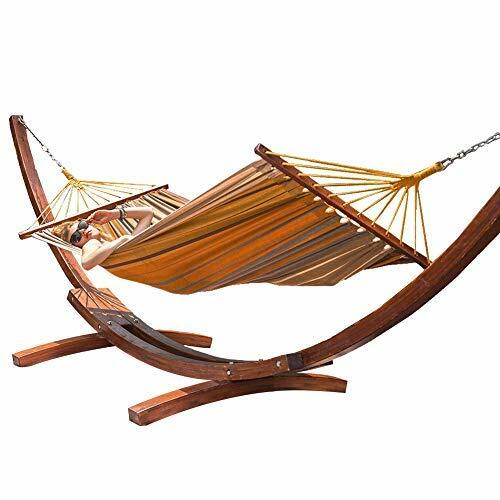 The elegant wood arc hammock stand and fabric sling is a deluxe and comfortable product, created to bring warmth and relaxation to your home. Create an outstanding exterior design statement with this wonderful product in your backyard or on your deck.